LEFT: The MAHS theater stage floor is being replaced. CENTER: The chairs have been removed from the MAHS theater. The chairs will be replaced. 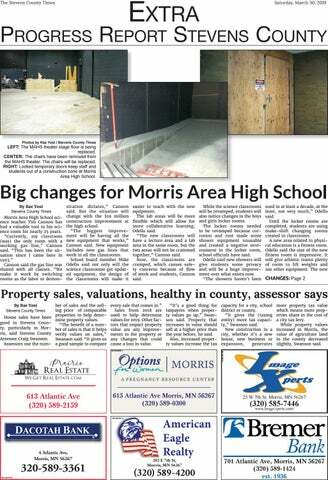 RIGHT: Locked temporary doors keep staff and students out of a construction zone at Morris Area High School. easier to teach with the new equipment. The lab areas will be more flexible which will allow for more collaborative learning, Odello said. “The new classrooms will have a lecture area and a lab area in the same room, but the two areas will not be crammed together,” Cannon said. Now, the classrooms are cramped, which causes safety concerns because of flow of work and students, Cannon said. every sale that comes in.” Sales from 2018 are used to help determine values for 2019. Other factors that impact property value are any improvements to the property or any changes that could cause a loss in value. more property tax value which means more properties share in the cost of a city tax levy. While property values increased in Morris, the value of agriculture land in the county decreased slightly, Swanson said. Bremer Bank provides a comprehensive range of banking, investment, trust and insurance services. With decisions made locally, Bremer employees are empowered to act on your behalf to answer questions, address your financial needs and help you get more for your hard-earned money. Visit Bremer today at 701 Atlantic Avenue in Morris and meet with experienced professionals that are ready to help you plan for your future. We will take the time to understand your needs and provide tailored solutions to fit your life. for each customer and see to it that these needs are satisfied. We have on hand desktops, laptops, printers and many other computer components. Stop by 208 Atlantic Avenue in Morris or call us at 320-5855688. Email us at store@techplusmn.com or visit our web page at techplusmn.com for additional information about our services and up to date inventory. Come to Tech Plus for ALL your computer needs. tah Bank employs nearly 600 people and serves over 60,000 customers. 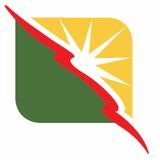 Considering the firm’s history and vision for the future, employees, stockholders, and customers alike are proud to say, “it’s good to be in Dacotah Territory!“ More information about the company’s history and services can be found at dacotahbank.com. titioner and part-time family medicine physician. Stevens Community Medical Center strives to offer comprehensive medical systems that meet the patients’ needs in an atmosphere that promotes healing and comfort. Inherit Clothing Co. opened on Atlantic Avenue in September. a retail location at 702 Atlantic Ave. and online through The response from the com- the internet. The business also includes pattern designs munity since Inherit Clothing and related items. Inherit Co. opened in September in sells locally, across the U.S. Morris has been “humbling,” and world. said Amy Ekren, who owns Ekren said customers may the business with her hus- see an item online but, then, band Anthony. “Better than want to see it and try it on in our wildest expectations.” person. So, customers have Inherit sells modest wom- come from the area but also en’s and children’s apparel in farther away. such as during the November Parade of Lights. Another benefit of the new location is the change in conditions for employees, Ekren said. “Employees were elbow-toelbow (before),” Ekren said. Now, there is more room, better lighting and an overall nicer environment, Ekren said. also be replaced. “We had duct tape holding some pieces of the stage floor together,” Odello said. The theater will also get new seats. The Stevens County Times has been serving the community since 1876. Originally known as The Tribune, the newspaper combined with the Morris Sun in 1947. The Morris Sun Tribune and the Hancock Record combined in 2017 to become The Stevens County Times. The weekly newspaper serves residents of Stevens County with a Saturday newspaper along with our website, StevensCountyTimes.com. You can also find us on Facebook, Twitter and Instagram. Call or email us with your news tips or for your advertising needs. Ask about our Print to Digital program. Environment Control Systems of Morris Inc. has served our community building hog barns and providing innovative solutions for hog farmers for over 40 years. Started by Jim Nordquist out of his home in 1978 and currently run by his son Mike, ECS is bringing quality service to our local farmers. In addition to building barns they also help with remodeling, provide equipment parts, ventilation programming and service calls for repairs. It’s all part of the comprehensive solutions to help improve hog production in Stevens County and the surrounding area. new works are hanged on the gallery walls, accompanied with meet-the-artist receptions. Also featured are adult and children’s arts classes, poetry readings and other events. Volunteers “man” the unique, homegrown art in the gift shop, so stop in and see what’s new. Currently on display is the work of Morris-based artist, Sarah Eckel. The new building for the Stevens Community Humane Society. It will also house pet related businesses. The design for the classrooms and fitness classrooms for the Hancock Schools project. strategic and finance committees, Schaefer said the goal is to provide the best opportunities for students and staff and to be good stewards of public money. “That’s what’s driving it,” Schaefer said of the construction project. The community supported the construction with an overwhelming vote in favor of a $7.9 million referendum in November.